Tokyo much? Zōjō-ji – Travel Much? Have you ever been jet lagged? It’s not good. You’re so tired that you can hardly remember your own name, despite the fact that you have been sitting still for over 11 hours – you feel exhausted. Legs ache, your body just feels odd, and your head feels woolly. Under these premises we had a few hours to kill the day we arrived in Tokyo, before we could check in to our hotel. This was when we, unknowingly, stumbled upon Zoji-ji, the temple I promised to elaborate on in the first post of my “Tokyo much?”-series. Zojo-ji is the Great Main Temple of the Chinzei branch of Jodo-shu Buddhism, and dates from 1393. As many other historic buildings in Tokyo, the original structure has been moved, destroyed in wars, fires and earthquakes. The Temple has been rebuilt several times, last in 1974. Zojo-ji was the Togugawa clan’s family temple, and 6 of the 15 Togugawa Shoguns have been laid to rest here. The main entrance to Zojo-ji is a huge gate, Sanmon (1605), and the three entryways are symbols of the three stages you have to go through to reach Nirvana. It is also said that you rid yourself of three vises when you enter through the gate; greed (貪 Ton), hatred ( 瞋 Shin) and foolishness ( 癡 Chi). Old Mamasan did not notice any changes in the three vises, nor any other vises, after passing through this gate. I choose to see that as being vise free in the first place. What vise would you like to rid yourself of? 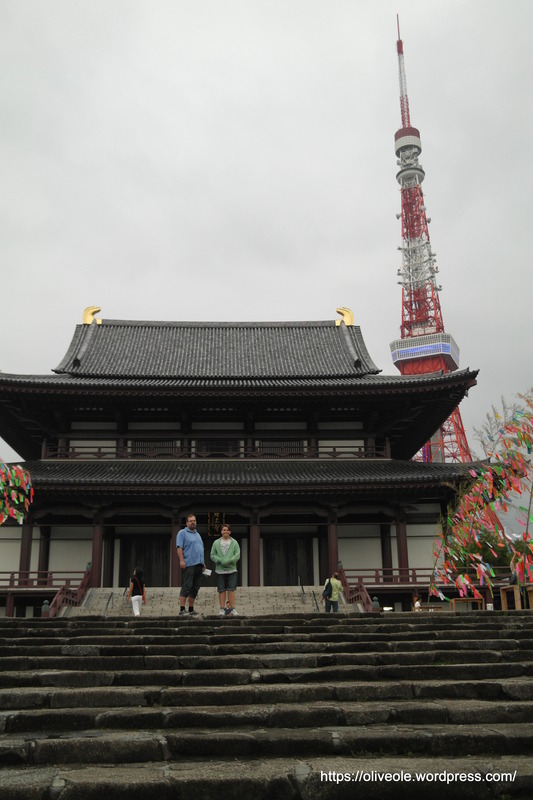 The Daibonsho bell was made in 1673; it has a diameter of 1,76 meters and is 3,33 meters tall. It weighs 15 tons. 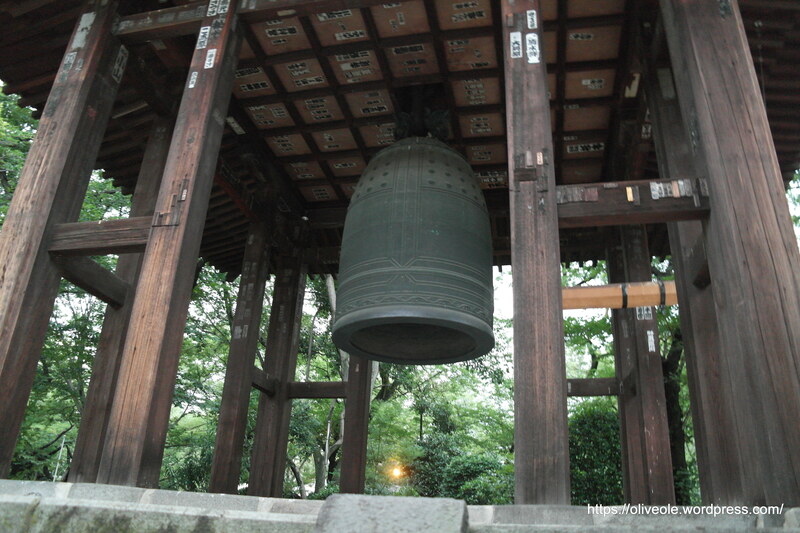 The bell is known as one of the three great bells from the Edo period. It is rung twice a day, and contributes to cleanse humans from the 108 earthly passions/vises, and installs great peace of mind. Visitors to the Zojo-ji can write their prayers on a colorful note and attach to one of the many trees by the main Temple. Along one side of the Temple garden, you find rows of stone statues of children. The statues represent unborn children, including miscarried, aborted and stillborn children. Parents can choose a statue and decorate it with small clothing and toys, and a small gift to Jizo – the guardian of unborn children (to ensure they are brought to the afterlife.) Next to some of the statues there are small piles of stones, which are also meant to ease the journey to the afterlife. On our second day in Tokyo we wanted to visit his restaurant (one of many restaurants at the Tokyo Prince Hotel), but it was closed due to a private arrangement. On our sixth day we were happy to see that they were open to the public, but unaware that we had to cook our own dinner! This was such a fun restaurant! 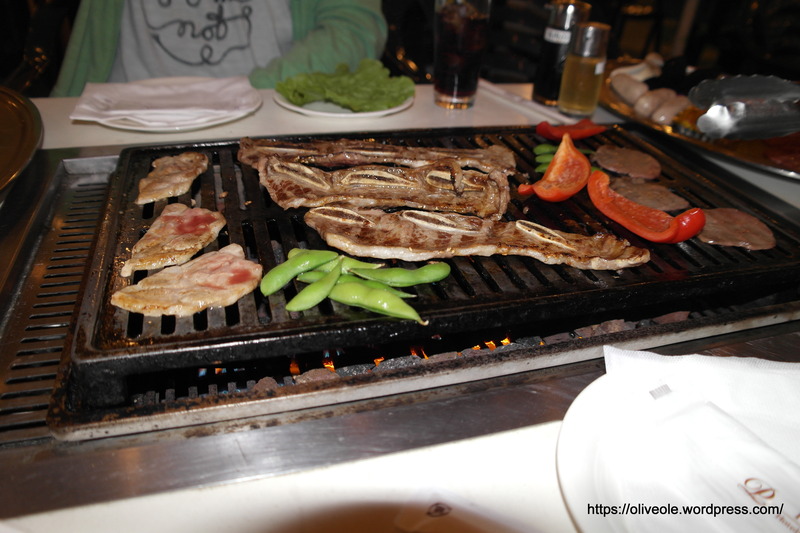 You order one of several menus, the grill in the middle of the table is lit and you have a god at whatever raw meats and vegetables are brought to your table. The meats were of very high quality, and we grilled it to our own preference. It was soooooooo good! And we ate sooooooo much! When you are in Tokyo, make sure you do not miss out on this very fun and tasty experience! 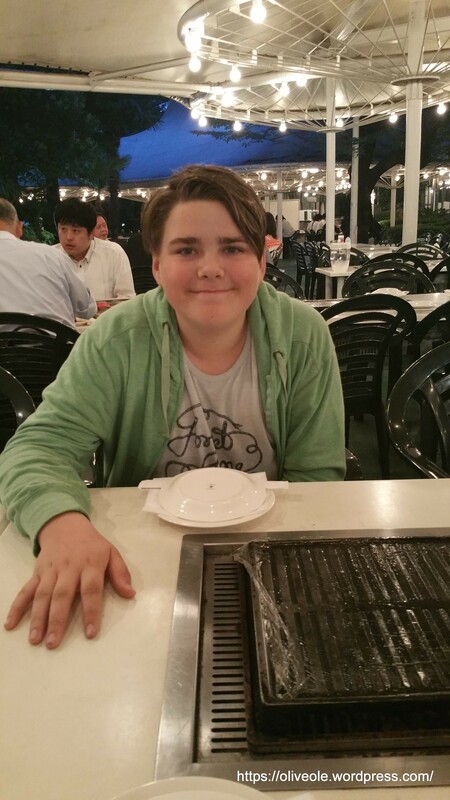 The Karate Kid is waiting for food! Look at all these yummies! 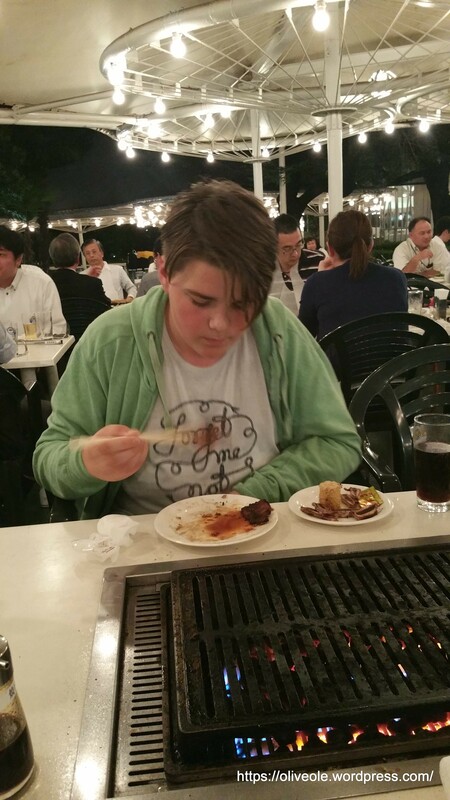 The Kid is getting a hang of the chop sticks. Stay tuned for the next post in this series, featuring matcha tea and vintage toys. 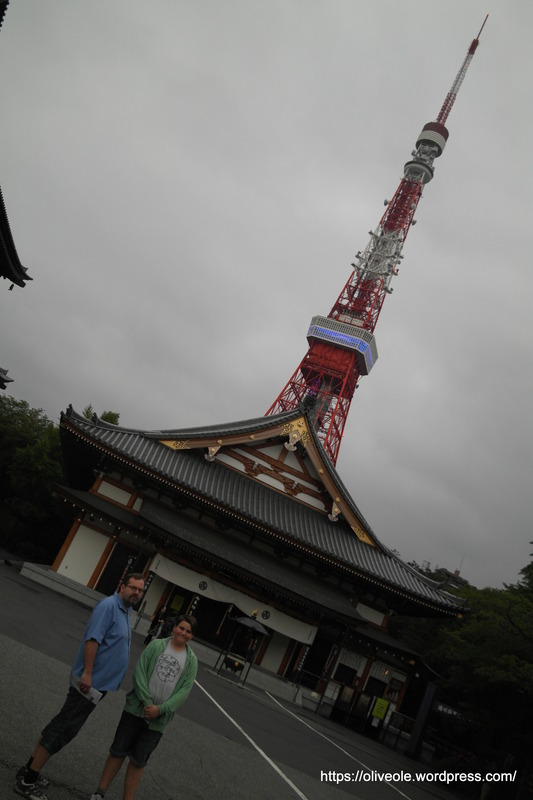 We could see this temple from above when we visited Tokyo Tower, but we had a rendezvous with some people to get to so we couldn’t go inside. It looks very interesting.